페니케, 포르투갈의 더 서프 엠버시 호스텔 | 호스텔월드에서 예약하세요. The Surf Embassy Hostel has been built to host all of those who want to taste the soul surfing lifestyle. 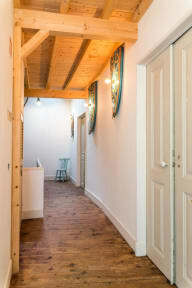 This surf-themed property is set in the historic centre of Peniche, at a 12-minute walk from the beach. The best place to breathe Portuguese culture and feel the energy of this amazing city. Featuring free WiFi throughout the property, this Hostel has three rooms with individual bathrooms, a fully equipped kitchen, eating area, shared living room with a patio and a balcony. All you need to sleep, eat and Surf! The Hostel offers ride to the beach when requested in a 1968 surf van. Free bikes and skates are available for guests' use. At an extra fee, the Surf Embassy Hostel provides surf lessons with qualified instructors, and a variety of experiences like Stand Up Paddle, scuba diving and trips to Berlengas Islands Natural Reserve.